Falls into that slim category of acceptable Greene King pubs, presumably because its attractions entice enough trade for the landlords to plough their own furrow and resist corporate control. Hence, two of the three ales were guests and a Redemption Hopspur went down very well. If a Dane were to visit, they'd be praising us for our understanding of the now ubiquitous 'Hygge' concept. Very small corner pub which actually has considerably more seating provided by the bench seating outside under the canopys than is available inside the pub. Lively mixed crowd both inside and outside on this last Friday evening before Christmas and there were actually twice as many bar keeps working the small serving space than there was along the entire long bar of the Swan next door , so there was absolutely no queuing at the bar. There are four ales available usually available but for our visit on entering one was reverse clipped, but fortunately it was the dreaded GK IPA (how we cheered ). This left Abbott Reserve from the GK stable, a bit too loopy at 6.5% for an extended session, and Redemption Hopspur and Woodforde's Wherry, the latter two being in excellent condition. Small but lively pub with well-kept choice of ales and good service levels. You have to go a long way to find a better pub than this in Bloomsbury. I first reviewed this pub on 6th April 2006. My opinion has not changed. It is still a brilliant pub. Im really surprised at the recent negative review by Nickeahle. 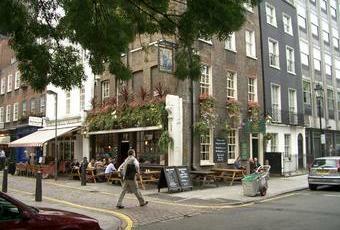 I am a regular at the Queens Larder, it is my favourite pub in London!!!! I don't often remark on other peoples reviews but I have never witnessed such a deliberately misleading, and malicious one so I am making an exception!!! I think the incident that Nickeagle ( otherwise known as DavidE on the same misleading review he has posted on another site!! )is referring to might be Thursday night at about 11.30 . I heard about this incident from someone who was in the pub that night. Apparently the barman was pulling the blinds back outside the pub. He obviously didn't realise that rainwater had collected in one of the blinds and it fell on a girl sitting outside. This is a totally different situation that has been inferred by Nickeagle by saying that the barman poured about 5 pints of water on her ( it does rather conjure up the vision of the barman tipping jugs of water over her doesn't it???!!!) This is a gross misrepresentation of the fact. I should certainly be wary of any further reviews from Nickeahle .Apparently the girl ran inside the pub and told the staff who helped her to clean up etc. I'm sure they would have offered to pay for dry cleaning etc, that's what normally happens in similar circumstances. I wonder if Nickeagle (or DavidE as he also calls himself!! )is the guy that was sitting inside the pub when this happened with a female companion who went over to the Portuguese barman and jumped on the bandwagon , threatening to have him deported, report him to the police etc??? A bit of racial abuse there!!! ( gives a little insight to the reviewer and the company he keeps or perhaps the beer was particularly strong that night!!!! Apparently he was inside the pub when this happened. The review does rather give the impression that he was at the scene giving a first hand witness account. If he did in fact see anything it would have been through a window!! I just can't understand why he would want to get involved in something that was clearly an accident and none of his business!!!! Get a life mate!!! There plenty of good causes out there for you to get involved in!!! Lol!! The staff at the Queens Larder are brilliant! the food, drink and service are excellent!!! That's why it is such a busy pub. Try it for yourself. If the barman throws buckets of water over you I will personally pay the dry cleaning!!! friendliness of the staff I always feel like a regular too. Couldn't recommend it enough.